This naturally effective cleaning product uses biological ingredients including enzymes and bacteria to remove urine stains and bad smells. Urine Off Odour and Stain remover will even treat old urine stains, without leaving any residue behind, and it is safe to use around humans and animals. Both the hygiene spray and the carpet cleaner are fragrance free, which means that any odours aren't just masked, but disappear along with the stain. When used initially, Urine Off has a pleasant citrus scent that melts away once the product is completely dry. In contrast with other cleaning products, the natural ingredients of Urine Off eliminate all of the different components of the urine, including urea and uric acid. Stubborn uric acid crystals are broken down, not just masked with fragrance or dried out. This means that even your pet's sensitive nose can't detect the urine smell anymore, so he won't be tempted to urinate in the same spot again, or to scent mark it. The formulation also contains a pheromone blocker that helps to discourage re-marking. The handy spray is ideal for both hard and soft surfaces, including walls and floors. The carpet cleaner has an injector cap that helps you to target and saturate items that have been stained; even mattreΒes and upholstery. Urine Off is made in the USA. Thanks to its incredible effectiveneΒ it has become one of the products that US veterinary profeΒionals are most likely to recommend for stain and odour removal. 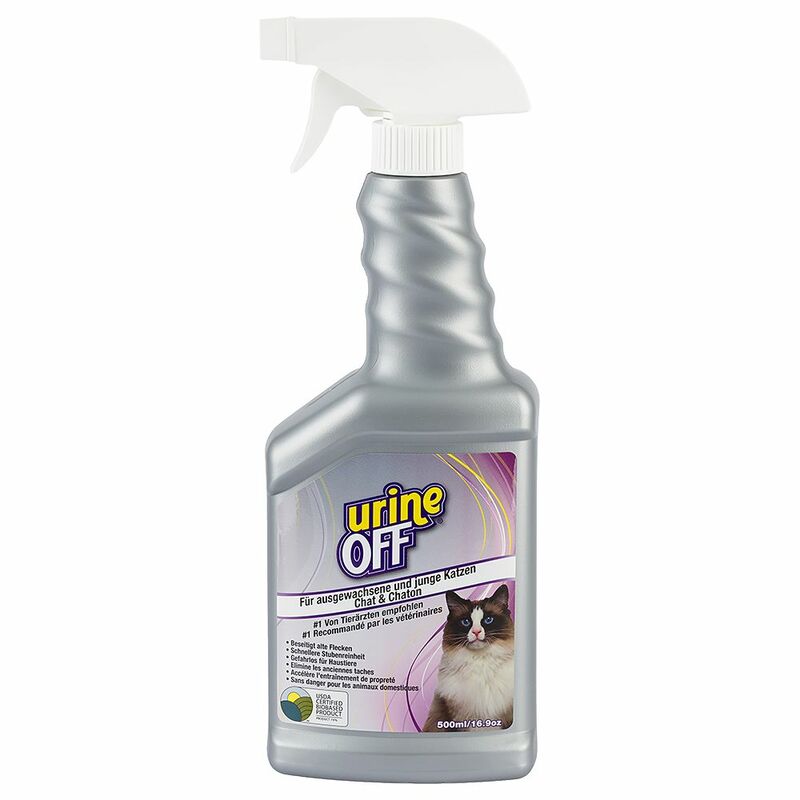 Urine Off Odour and Stain remover at a glance: Effective spray to remove urine stains and prevent odours Also suitable to combat urine spraying in younger and older cats 100% Biological: safe for humans and animals High performance bio-technology: uses the power of enzymes and friendly bacteria No alcohol or solvents Works hard: Gets rid of fresh and dried-in stains Residue-free removal of urine from hard and soft surfaces Also ideal for cleaning cat litter trays Breaks down uric acid crystals: For permanent stain and odour removal Even sensitive cat noses won't detect remaining urine smells With Pheromone Blocker: Prevents renewed scent marking Fragrance Free: Eliminates smells, rather than masking them Gentle citrus scent: Disappears as soon as the product has dried Safe for animals and humans Recommended by vets Made in USA Usage instructions: Always do a patch test on a small concealed area of fabric or carpet before using the product. Do not use in combination with other cleaners or carpet shampoos. If poΒible, soak up any remaining urine before treating the stained area. Soft surfaces (upholstery, carpets): Thoroughly soak the urine stained area (and any underlying materials) in Urine Off and allow time to dry. Repeat if neceΒary. Rinse the treated area with fresh water and dry with a cloth. Hard surfaces: Spray the area generously with Urine Off and allow the product to dry. Wipe any drips with a cloth or paper towel. Once dried, wipe the area with fresh water. Washable items: Soak..